Mill Creek is excited to share that the Xtinguish Celebration has been featured on the Cleveland blog Waiting for Next Year! We are excited for 2019 as we continue to share our conservation efforts and upcoming events. Extinguish the past, ignite the future is the tagline for the 50 year celebration of the last fire being put out on the Cuyahoga River. Randy Newman’s Burn on from the 1972 album Sail Away has helped keep the image in popular culture1 and Great Lake Brewery’s Burning River Pale Ale continues to remind those local to Northeast Ohio of their past. Both the Cleveland Browns and Cleveland Indians last won a championship when Standard Oil was still dumping the “dregs”2 directly into the Cuyahoga River. However, there are now two full generations of people in Northeast Ohio who only know the beauty of the region’s natural treasure. Marking the triumph of ending the fires that raged upon the waters intermittently from 1868 through 1969 is well-deserving. Therefore, the Xtinguish Celebration series of events over the course of 2019 is set to commemorate one of the most massive environmental clean-ups in human history rather than focusing on the decrepit state that the crooked river had been allowed to fall into before the blaze. Perhaps it is even time for Newman to update his song lyrics? What is Xtinguish Celebration and what organization is planning it? WFNY discussed the events with the Central Lake Erie Project Manager of Westcreek Conservancy (WCC), Peter Bode.3 An individual who was just named to The New Agency through the Museum of Contemporary Art; Cleveland’s list of local talent pushing the city forward with innovation. Who are the organizations behind the celebration? Peter Bode: There are over 350 partner organizations, agencies, municipalities, and businesses that are coming together for this celebration efforts! Why is this 50 year celebration important? PB: This is our chance as a region to truly show the world how unique and vibrant our culture is. This marks the 50 year of revival of this storied waterway. 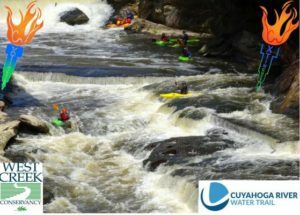 It started with individuals that have a passion for the Cuyahoga, and saw its potential. We’re working to truly showcase the fruits of their labor, as well as highlight where we need to go to better our region even more. There is always room for advancement. Peter, Please post more details of the various events taking place from June 19-22, 2019. Can’t find it. We’ve just added some additional information to our website as well. The Xtinguish site will have the latest event details.